Earlier today Nokia’s Developer organization (aptly named Nokia Developer) released a set of really interesting numbers. Let’s drill down behind the numbers and reflect for a second what they mean for selling and marketing your app. From astounding fact that Ovi Store is available in 190 markets to interesting tidbit that Turkey sees 1.6 downloads a week this article is a must read for anyone doing software localization. So 9 out of 10 Ovi users see the store in their own language. What does that mean? First of all: your app needs to speak local language. We knew that already didn’t we? But secondly and even more importantly: your support and marketing material (like webpages) needs to speak user’s language. Localized apps and support material stand out in the crowd of English only apps and it makes it more likely that your app is promoted in country specific recommended lists (it also helps if you have a strong local brand). What languages I should support with my app? Is my web page and marketing material available in all relevant languages? Am I addressing the right markets with my app? What does it mean for my application to support Right-to-Left/non-Latin character set languages? Is my beta test audience right? It would interesting to drill down even further to these numbers. What is the actual order of these countries? What are the top grossing countries? Hopefully we will get to see these numbers next time. Series 40 accounts for 25% of the Ovi Store downloads. And number of Series 40 devices out there is mind-boggling: 650 million. Series 40 users would form the third biggest country by population in the world! In China Ovi Store is 7 times bigger than Apple App Store. Active users download something 8.5 times a month. Interesting numbers, aren’t they? What is the most important or interesting of all the numbers? And what number you would like to see to support your app business? I’m proud to present a Get Localization June Release. It’s bigger than normally as it incorporates so many new features we’ve been cooking up for you guys. I’ll briefly introduce these features so you can get the idea what to expect. During coming days, we will provide videos and blog posts that cover these features more in detail. This release is all about website translation. We’ve been extremely good in providing translation tools for mobile/app/client developers in the past but we felt that our offering for web developers was not that good. This is now changing as we introduce In-page Editor 2.0, a remarkable piece of technology that changes how websites are translated. We released our first prototype of In-page Editor last year June 23rd, almost exactly a year ago. We felt that there was huge potential in this technology but time just wasn’t right to go all-in with it. This is now changed, website translation is one of the key issues developers are struggling today and we want to help with that. 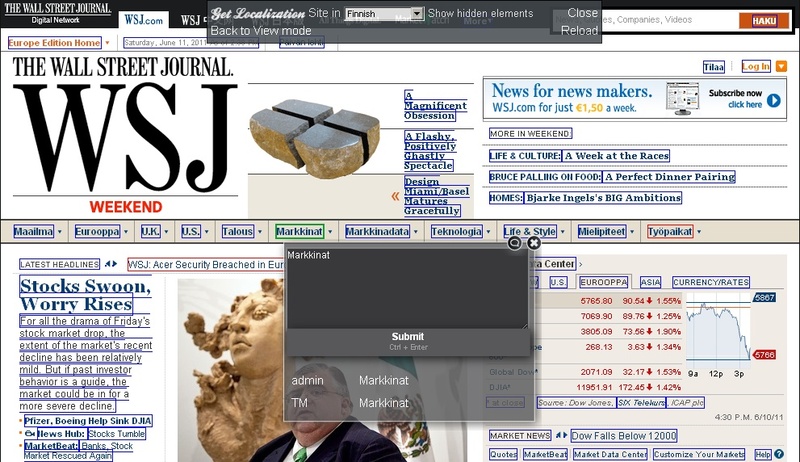 Previously our In-page editor was a bookmarklet (and it still is) but now in order to provide best possible user experience for translators we provide widget that helps you to incorporate In-page editor to your own site really easily. Extras file contain all those strings that were translated with In-Page editor but were not found from django.po file. You can translate all the content with In-page Editor. It works with WordPress, Sharepoint, Joomla, basically any CMS system in the market. 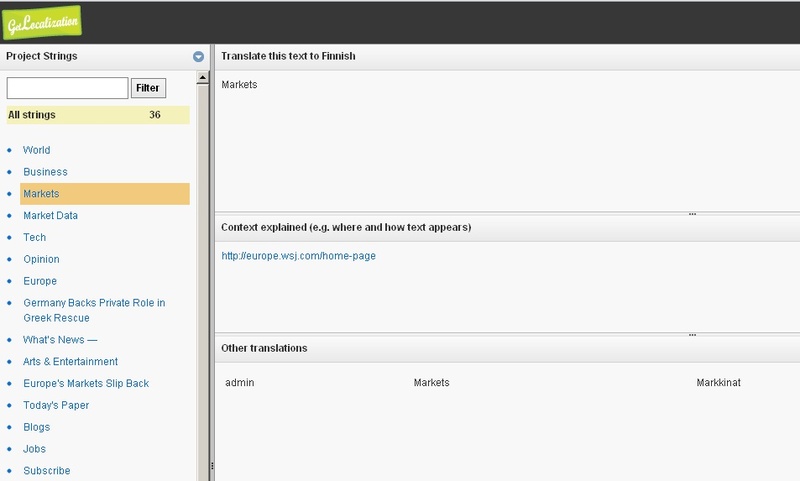 Get Localization Translate API is quite similar in architecture than famous Google Translate API. As you may know, Google Translate API is now deprecated and will move to paid model by the end of this year. API being really similar gives you an advantage to migrate easily from Google Translate API to Get Localization. Of course it won’t give you machine translation feature but it will give you an opportunity to translate your site really easily using crowdsourced or professional translators. This will definitely improve the readability and provide better experience for your users. 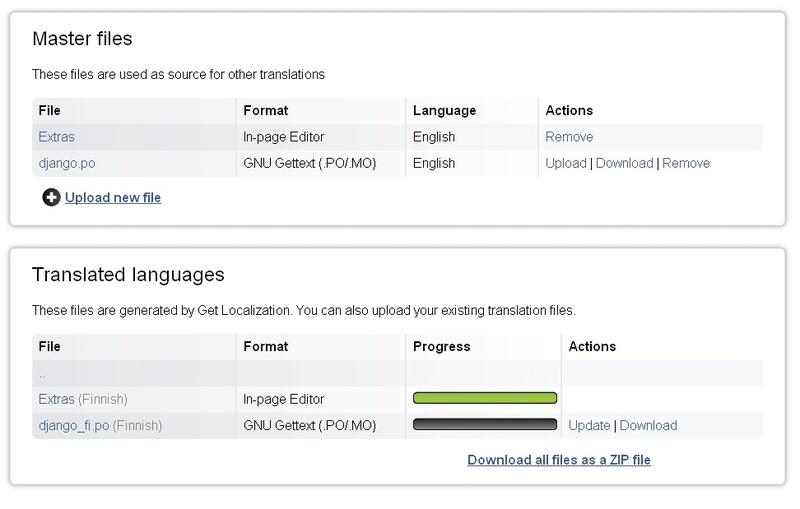 With Get Localization Translate API, you don’t need to use any i18n framework. You can simply use In-page editor to translate your site and with API, translations are available in similar fashion as using Google Translate API. Try them out, They Are Free! We would love to hear some feedback, I know this is quite much to digest at once so we will provide videos and more information that will clarify these features in coming days. So please, send us your questions and feedback and we will try to answer them. All the features are live already today so you can try them yourself. You can find the instructions under your project “Settings” tab. And just a friendly reminder that we reserve the right to limit your bandwidth if you go crazy so if you’re planning to use these with high traffic site, please contact us first to discuss about details. We will also roll-out these new features to our Lingodesk product family as soon as possible. You can learn more about Lingodesk from our company website.